Subject: A new "Spiel des Jahr"-nominee? 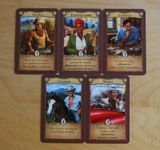 In 'Cuba' the players try to gain prestigepoints by developing their plantations, build buildings, buy, sell and ship goods and make sure the government gives a little push in the back. The player with the most points after six rounds, wins the game. The game set-up consists of a central board with the parliament, where the current laws are shown; the market where goods can be bought and sold; the harbour, where ship are docking to be filled and the scoring track. 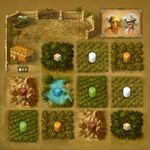 Each player also receives a personal plantation board, showing his plantations, buildings and storage. The game itself is divided in six rounds, each of basically five phases. In the first phase, four proposal for new laws are made. This is indicated by the turning of four cards at the parliament. These laws are not yet active but give a taste of possible things to come. Phase two is where the meat of the game is. The players can now choose four of five action cards. A card is selected and executed. Now the next player chooses a card and execute it and so on until all players have played four cards. This enables you to move the worker on your personal board and activate all plantations orthogonally of your worker's location. This will generate goods and resources needed for buildings and trading/ shipping. She will enable you to sell and buy goods at the market. The price of the good is as indicated on the board and ranges from 1 to 6. If you don't want to buy or sell, you can choose her special action which will give you either a resource or the cheapest good for free. By choosing the architect, you build one building on your personal board. All building are shown next to the main board and as long as you can pay the resource, you can select any one building and build it. These buildings can give extra benefits to generate goods or money, convert goods or do all other kind of things that make life easier. Just like the tradeswomen, he also has a special action which will just generate 1 or 2 points instead of building a building. He is on your own plantation board at the same location of the worker. By choosing the Foreman-card, you activate all buildings orthogonally of his current location or one building of your choice. He will allow you to ship as many goods as you want and as can fit on one ship, thus generating points. He also has a special action which will give you money if you decide not to ship. When every player has chosen four actions, the third phase starts. Players now take their last action card and, if they want, extra money to become the one to choose which laws will pass. The player with the highest action card (from 1(worker) to 5(mayor))+ money (one point for each coin) will be able to choose two of the four laws which will become active. At the end of sixth round, extra points are awarded for the buildings you have build and the player with the most points, wins the game. 'Cuba' is one of those lighter tactical euro-games you find nowadays. 'Pillars of the earth' fits in this category as well. However the luck factor in this game is quite low and that makes it possible to set out some nice strategy. Like many games it's again about setting up resource trains to generate resources/ goods which generate points. Mixed in all this is some money management as well. 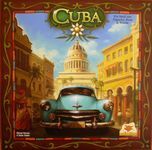 Although 'Cuba' is certainly not a heavy game, heavy and light gamers will both like the game due to its comprehensive rules, different options and nice graphics. Interaction is pretty limited but sufficient to be of importance. Why should I like this? Why shouldn’t I like this? - The limit of six rounds makes it difficult to set out long term strategies. 'Cuba' is a great family game which may very well come on the nominee list of 'Spiel des Jahres'. And that's exactly where it belongs. Not too light nor too heavy, some luck but not too much. If you are looking for a game like Pillars, San Juan or even Ticket to Ride, I would certainly give this a try. Thanks for the early review. Personally, I think Cuba is a little too similar to Pillars of the Earth instead of Zooleretto. Meaning, I don't think it's going to be shooting for the 'Spiel des Jahres'. Of course, I could be wrong. Wow. From reading the rules I didn't think this game would be in the same strategy level as San Juan or Ticket to Ride. I found SJ and TtR to be very very light. The impression I got was that Cuba is a little above Notre Dame and Ra. What did you think of the voting mechanism and its overall effect on the game? Does it place players in positions where they have to take one for the team so that the leader doesn't run away with the game. I agree. Reading the rules it doesn't appears at all that this game would be a light game like TTr. Probably like Age of Empires III in many ways ,many paths to get VP, some luck, but not too much, good graphics, very well known mechanisms. Tried at Essen. Gorgeous graphics and yes, somewhere between Pillars (but less luck involved) and AOE III. AoE III is probably the best game to compare this one to. 1) To create an uncertainty on how the round might end. Everybody wants to cash in on those extra VP's but only the winner of the auction will determine exactly what is needed. 2) Certain laws can be beneficial to certain strategies. For instance if you have a money generating building, it can be interesting to keep the taxes high. I played the game again yesterday and until now I can not say that the laws are a way of blocking the leader. The game has some more strategy than TtR since there are more options to choose from. What I meant with this comment was more an indication of the level of complexity/brain-burning-factor involved. It seems to be a complex game but actually has a very fluent gameplay. But due to the amount of options you have, it has more possibilities than e.g. TtR. We just miss out on the 2 point bonus. But there are better ways of turning 5 pesos in 2 victory points so when tax is high, most players in our group don't pay. I like the way you review games, especially how you summarise your viewpoints at the end of the review. Very useful. Keep up the good work. Yes, and the pictures break up the review well. The review is very easy to read. I like reviews where I can simply skim (or read the summary) to get an idea of the game, then go back and read the whole thing if it interests me. I agree with several commenters that Cuba is definitely heavier than the portrayal as a "light strategy game." The number of mechanics to juggle is roughly equivalent to Puerto Rico or Caylus, with inter-player competition just a little less than those two. Of the other games I've played, Notre Dame is a good comparison, but maybe slightly heavier than that one. I'd hate for the average Ticket to Ride player to foist it on their non-gamer buddies and get in a little over their heads without meaning to. I'm all about people challenging themselves to a slightly heavier game, but they should do it with some fair warning -- otherwise it's the kind of experience that make many lighter gamers never want to try a medium/heavy again.